Is sumo a real sport? A couple of weeks ago I blogged about sumo wrestling over at Ethics for Adversaries. A lot of the stuff I used to blog about here — especially issues over rules, regulations, and norms of sportsmanship — is also fair game over there, but I will try to at least cross-reference posts that could fit on either blog. That post used Japanese reactions to recent scandals in sumo to tell us something about how we see the interplay of ritual and genuine competition in some of our more beloved sports. In answer to the question in the title here: of course, sumo is a sport. But with some prominent fans willing to turn a knowing blind-eye to match-fixing, the spectre of a more urbane form of WWE pro wrestling looms uncomfortably in the background. The true sumo aficionados are, of course, are sickened by the repugnant whiff of match-fixing — brought about not by gangsters but by the competitors themselves in a you-scratch-my-back-I’ll-scratch-yours arrangement. Many fans are deserting sumo because it loses much of its interest if it is (I suppose) just a couple of under-clad obese men play-acting. There is something about competition itself, over and above any other features of athletic prowess, that we crave in sports. It is why we seem to find it much more compelling to watch almost any activity now — from glorified Karaoke singing to extremely large people losing weight before our eyes — if it is staged as a competition. Match fixing abhors us in the same way that price-fixing abhors economists. To paraphrase Adam Smith, sumo wrestlers, it seems, seldom meet together, even for merriment and diversion, but the conversation ends in a conspiracy against the public, or in some contrivance to take a dive. Posted in: aesthetics, partisanship, what is a sport? ← GQ’s 25 Coolest Athletes of All Time. Pretty cool. Unlike the entertainment sport of wrestling in the WWE, the allegations of game-fixing are more or less are admitted or obliquely accepted even by the fans, but in other sports like the UFC and especially boxing, the allegation of fixing is vehemently denied, and the sports body would even go to court to defend such untruth. 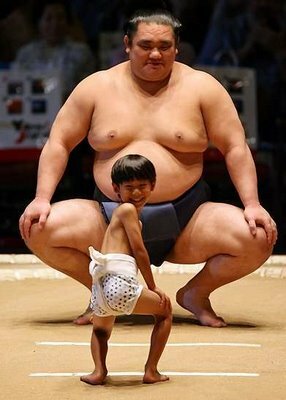 In sumo, are there occasions of individual fight fixing complaints or is the sport really a spotless one?